Phalaenopsis orchids are a group of sub tropical to tropical orchids. 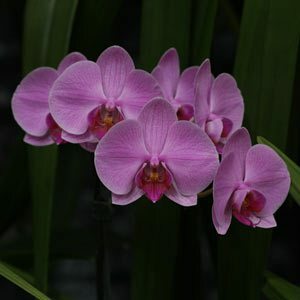 Also known as Moth Orchids, they are readily available for sale, and easy care, even for beginners. Popular species include Phalaenopsis amabilis or ‘Moon Orchid’, Phalaenopsis gigantea from Borneo and the newly discovered Phalaenopsis venosa. Phalaenopsis Orchids were probably the first popular orchid species for growing indoors as they are fairly easy to grow. Basic requirements are warm temperatures and humidity. Numerous hybrids now are available although Phalaenopsis Doris was the first. Phalaenopsis hieroglyphica is a species with very attractive markings on the petals, well worth looking for. Phalaenopsis Orchid Care and growing hints. Phalaenopsis orchid care means providing a warm humid climate, Phalaenopsis orchids are originally from the Philippines, and South East Asia. As Phalaenopsis Orchids like a temperature range from 15C to 26C they make a great indoor plant. As long as the indoor temperature does not drop to low they are happy. Cold temperatures during flower formation are the major issue. Light – As these are an orchid that prefers filtered light they are also great for indoors. Light from a window is adequate, filtered or indirect so as not to burn the foliage. Here we try to mimic nature, filtered light is best. 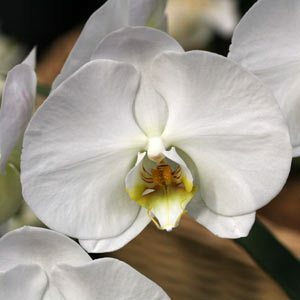 Filtered light is best as Phalaenopsis orchids come from a rainforest So although a window sill is fine, direct light is not, a fine curtain will filter the light as will open shrubs outside the window. Watering – Good drainage is essential, however a constant moisture level is also important, with proper growing mediums watering once or twice a week is adequate. Place the pot on a saucer filled with stones so that water is below the pot, this creates humidity, water in the morning daily. Watering of Phalaenopsis orchid is easy, just remember they must not dry out, and must not become water logged, it is better to water the orchids in the pot than to spray. Humidity is important, Phalaenopsis Orchid like a humid environment a saucer of water beneath the pot is usually adequate, do not sit the pot in the water, use pot feet or fill the saucer with peddles to lift it above the water. Add some diluted fertilizer to the watering regime every 2-3 weeks. Slow release fertilizer is also OK. Try not to over fertilise. Fertilizer is best to applied in a liquid form, most specialist orchid formulations work well. Phalaenopsis Orchid not flowering, usually caused by a lack of light, this can be indictaed by being very dark in colour. Like many orchids the flower spikes are also set by a period of cool nightime temperatures, however to cold and flowers will not set. For most of the growing season Phalaenopsis orchids require a minimum night temperature of 16C. A glass house situation is ideal however many people grow Phalaenopsis orchid indoors. Overwatering – You do need to consider the potting medium when watering, some are more water retentive than others. Lack of light – Although thee are a ‘Low Light’ Orchid, a better description might be ‘Good Filtered Light’. Pollutants – Smoke from wood fires, cooking fumes and aerosol sprays cn all cause problems. An open free draining potting mix is essential for Phalaenopsis Orchids. A medium Pine bark mix is excellent. 10 -20mm is OK. Repot every 2-3 years and be careful, as the roots of these plants are a little brittle. Try not to ‘overpot’. The roots will start to grow out side the pot eventually, a sure sign that repotting is required. These orchids will flower in Autumn and again in spring given the right conditions. Tall spikes of up to 10 blooms are common once established. Phalaenopsis orchids can be pruned after the first flush of flowers begins to fade to encourage a second flush. Many Orchid Genera available Zygopetalums, Oncidiums, Vandas , Dendrobiums and Phalaenopsis . Flasks available and Orchid laboratory service for green pod sowing.